My what a big phone you have! The LG V20 was recently introduced with some excellent features that rival the other major manufacturers Android 7 phones. It’s a big phone. Sporting a large 5.7″ diagonal screen, this phone measures 6.29 x 3.07 x 0.30 inches (159.7 x 78.1 x 7.6 mm). These are the key measurements for selecting your mount. Mounts with custom cradles for a different phone are unlikely to fit the LG V20. For those that have a universal mount, hopefully it opens wide enough to hold the LG V20 without a problem. Some universal mounts offer options to upgrade your cradle to a larger one. Be very aware of the size of any cradle, this is a large phone that may not fit in many cradles. Add a case to the phone, and you might be approaching 4 inches in width. Some universal cradles open to 3 inches, so check it out. Speaking of cases, buy a case for the LG V20 as it’s not a cheap phone. We have always liked the Otterbox Defender series which we reviewed here, but there are lots of others. Invest about $25 or so. A single drop on ceramic tile that results in a broken lens will cost way more than the case. If you think insurance will cover you, think again. Insurance policies purchased from your carrier have a deductible and for newer more expensive phones that can be $169 on up. So to add insult to injury, you will not only be paying the monthly insurance premium, but you will then pay the deductible. You can read our article on phone insurance here. Moving on to the mounts. We’re going to recommend mounts with expandable cradles that will be large enough to hold the LG V20 along with or without a case. The vent is a great location for a phone. Don’t have to worry about the legalities of the windshield and it stays somewhat hidden from view of potential bad guys. One of our favorites continues to be the Square Jellyfish Jelly-Grip Car Air Vent Mount. That’s the mount that is in the accompanying photo with this article. The Square Jellyfish Jelly-Grip will hold the LG V20 with or without a case. It has a ball and socket so the cradle swivels into any orientation. This mount will work on flat vent slats that are 3/8 to 1 inch deep. The included cradle opens to 3 5/8 inches which gives us plenty of room on the sides. The windshield is the most popular location to mount especially if you plan to use it as a GPS with my favorite application which is Waze. This is a big phone so you need a big cradle. The Arkon Ultra Slim Grip Suction Mount will do the trick. This mount has the necessary expandable cradle which expands to almost 7 inches when using the longest set of legs. The phone is held from the top and bottom. This will fit your phone with or without a case. The mount comes with an adhesive dash plate so that you can attach to the mount to your dash as well as your windshield. This dash disk is handy for states that do not permit windshield mounts which we documented in a recent article. The phone can rotate 360 degrees into portrait or landscape using this mount. 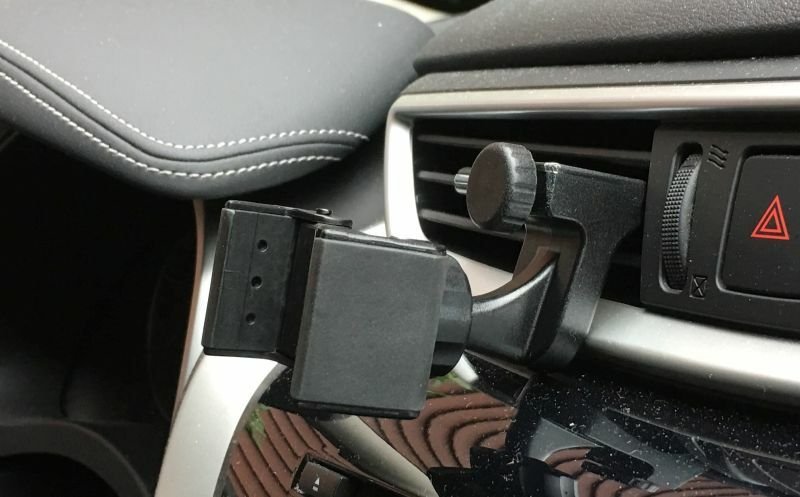 Another favorite is the iKross Cup Holder Mount for Tablets and Phones. These mounts serve a dual purpose in that a cradle for a phone and a tablet are included. The mount is adjustable and solidly made to easily handle the weight of a tablet so this phone is a lightweight comparatively speaking. You will see a lot of mounts on the market for tablets or cell phones. This is the only car mount kit that we know of to offer two different cradles, one for the phone, the other for the tablet. The back of the LG V20 continues the design aspect of locating the finger print scanner and power button on the back of the phone along with a dual camera. We’re not fans of the design, but it does present some challenges when it comes to mounting. Be sure to get a cradle that isn’t going to block the camera and / or press the power button. You need a cradle that is going to grip the LG V20 right in the middle and below that button. So a lot of the mounts we normally recommend for a smartphone on a motorcycle aren’t going to work well with the LG V20 because there’s a good likelihood that the camera or power button might be blocked or pressed in while riding. The TechGripper Handlebar Mount Kit combines a center gripping cradle with a solid handlebar mount. The mount is constructed of metal and black in color. It fits handlebar diameters from 7/8 to 1.25 inches so it covers the majority of motorcycle models that can accommodate a handlebar mount. The cradle opens to four inches. An included small hex wrench is provided for installation. Rather simple installation. We always recommend tethering your device when using on a motorcycle for added security. Safety is of utmost important on a motorcycle so be sure this mount is solidly installed and pay attention to the road.